You are surrounded by green. More than just the White River National Forest, we are working to protect our environment too. We use eco friendly laundry methods, participate in local Actively Green Program and encourage guests to re-use their towels. Also, please recycle at the dumpsters near Buildings 4, 7, 12, E and M (mixed glass, plastic and aluminum). The Vail Racquet Club is a proud participant in the Actively Green Sustainable Business Certification here in the Vail Valley. Continuously seek to improve our environmental performance. Reduce the pollution, emissions and waste while increasing the resort’s recycling ethos. Develop and increase responsible purchasing methods to include sourcing products, such as locally produced goods and using suppliers that maintain ethical practices. We have recently appointed a Green Team Leader to direct our Green Team which is made up of General Manager, Treasurer and Head of Maintenance. They will meet once a month to ensure a targeted focus on environmental issues and encourage the generation of ideas and implementation of appropriate measures. The installation of energy saving appliances which includes electric convection ovens, new low energy dishwashing machines and more ecologically friendly refrigerators. We have looked at ways to reduce, reuse and recycle the types and quantity of waste produced by the resort, ensuring it is disposed of correctly and also considering alternative ways of dealing with waste. This included glass, cooking oil, paper, cardboard, and ink cartridges. We have eliminated the need to segregate waste streams by implementing a single stream recycling center; ensuring that glass, cardboard and paper are all recycled easily. Through the installation of Visual One software and the automation of processes, we have been able to move to ‘paperless’ offices in our back office functions such as Accounts, Reservations and the Front Desk resulting in the reduction of paper usage by over 80%. We do implement ideas and take action to reduce the environmental impact of the resort caused through travel, whether through deliveries or purchasing more locally sourced and ethically sound products. We demonstrate our commitment to sustainability and the use of multi-certification in some areas such as Fair Trade clothing lines, and locally produced Tea and coffee. We screen our suppliers to ensure they share our environmental ethos. Sharing the message on sustainability to guests and staff is important in engaging people in this cause. Our front desk makes a point of relaying our environmental sustainability commitment to our guests while promoting the free public transportation the Town of Vail offers in the form of highly convenient buses at no charge. We also encourage our guests to engage in the sustainability discussion by asking for their views on our Comments and Feedback Forms regarding ideas on what we could do better for the environment. We appreciate the importance of making a positive difference in the communities in which we work, live and interact with. In this regard, we do work in supporting a number of charities and sustainable events. 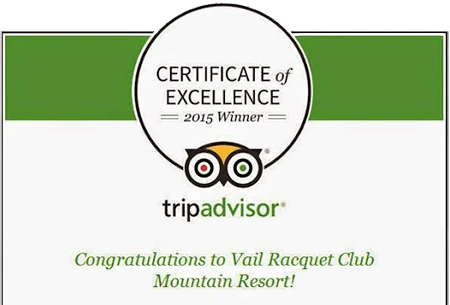 The Vail Racquet Club has progressively strengthened its environmental actions over the past few years and continually works to minimize the adverse environmental impacts of its operations by involving guests and suppliers in its eco-awareness. This is our environmental path to date and we are moving toward improvement in our Environmental Sustainability Action Plan.